If you’ve ever had a blowout during a road trip, you’ll know first hand how important it is for vehicle owners to own a tyre pressure gauge. This is a basic part of vehicle maintenance, and we’ve all occasionally dipped over to the gas-station compressor, and topped up the pressure. Would you believe that this has more pressure than the rubber on your cars? 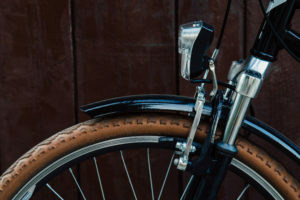 It’s well known that checking the pressure in your car tyres is important, but what you may not realize is that pressure gauges are even more important for cyclists. Did you know that bike tyres are often filled to a higher pressure than the ones in your car? This means that, under certain conditions, they can be more likely to blow. When you have a blowout on a vehicle, you’ve still got three wheels to steer you to the side of the road. But on a bike, there is nothing to fall back on. Improperly pressurized tires can put you in harms way. Fortunately, mountain bike tyres don’t require specialized gauges. Accuracy is of a little more importance, but automotive and cycling gauges are mostly interchangeable. This means that if you buy a good tyre gauge, you can use it for both your vehicle and your bike. It also means that they’re widely available. What Types of Pressure Gauges are Out There? 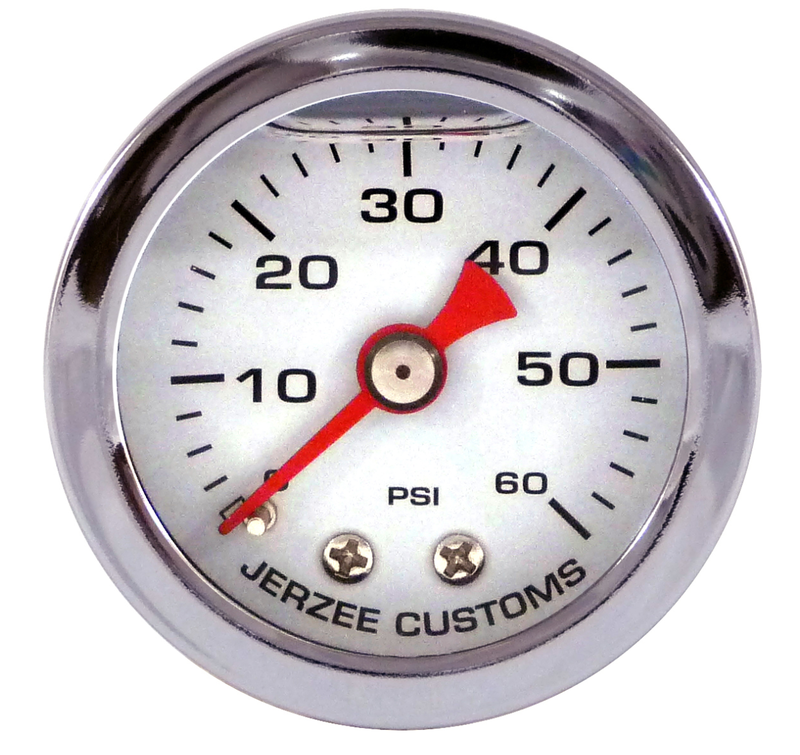 There are three different types of pressure gauges on the market. Each has their own set of advantages and disadvantages, although certain types are in more widespread use than others. Dial gauges were, historically, the most accurate models you can buy. They resemble a pen with a small clock on the top. You place them on your tyre, and the dial rotates to indicate the pressure. 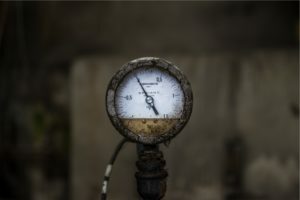 You’ll find a lot of high-end dial gauges on the market, many of which include accessories such as an extension hose, multi-unit scales, and a bleed valve so you can drop your tyre pressure. These stick type gauges are what most people think of when they imagine a tyre pressure gauge. Place the inlet on your tyre, and a stick slides out. Like a ruler, it measures the pressure in your tyre. These are cheap to produce and readily available, but have a limited span and are somewhat inaccurate. As the most modern and powerful gauges on the market, these are often our first choice. They use a compact, single-line LCD display, much like that of a calculator. The pressure is calculated by a digital sensor, which provides a higher level of accuracy than mechanical sensors. These gauges are often a little bulkier and require batteries, but they are our number one choice. There are two key advantages to a digital gauge: accuracy, and range. Although dial indicators are often promoted as being much more accurate than rod types, this is simply not the case. When you’re reading an analog gauge, there is only so much accuracy you can get. Your eye will never read it perfectly, and the gauge will wear out over time. But digital gauges won’t fade out of calibration over time, and they provide the highest level of accuracy possible. Additionally, you’ll be able to use your gauge for both your bike and your car tyres, so you only need to make a single purchase. 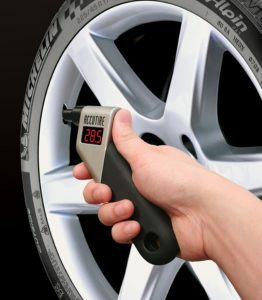 In this roundup, we’ll be taking a look at the 5 best digital tyre pressure gauges on the market. We’ll show you our top picks to find out what they have to offer. After, we’ll help you decide which one is right for your needs. Riding like this increases friction, warming up your tires increasing the pressure. A common misconception is that you simply throw a little air in your tyres, give em a squeeze, and ride off. If you fill them too much, or too litte, your ride quality can be negatively impacted. Additionally, your pressure will change throughout the day, depending on how you’re using your bike. The two most important factors in tyre pressure are temperature and volume. Your pressure will change with the weather. When it’s hot, your pressure increases. When it’s cool, it decreases. Friction also factors into this. If you’re riding downhill through rough mountainous terrain, the additional friction will warm up your tires, and increase the pressure. Have you ever noticed that your bike feels a little bouncier after ripping down a dirt hill? The cause is most likely friction and temperature. The volume of your tyre is also an important factor. The larger the tyres, the less pressure you need. 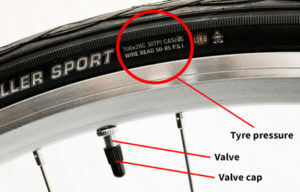 Road bikes are typically inflated to a pressure between 125 PSI and 75 PSI, as they have very thin and compact rubber. Mountain bike tyres, on the other hand, should be inflated to around 30 PSI. Larger and more aggressive models may have an even lower pressure. Hybrid tyres average 60 PSI, but this depends heavily on the model. The exact specifications will be found on your tyre, but this general guideline should give you an idea of what you need out of a digital tyre pressure gauge. For most consumers, something fancy isn’t necessary. That’s why our first choice is affordable, reliable, and easy to use. The Tekton 5941 digital pressure gauge is both durable and ergonomic. It’s molded plastic shroud has grooves for your fingers. This allows you to keep a tight grip while pressing it onto your valve stem. It has a loop on the bottom corner, so you can quickly tie it to your tool bag or air pump, and keep it easy to access at all times. The tip of the pressure gauge is illuminated with a soft LED glow. It’s bright, easy to see tip allows you to pump your tyres up even under cover of darkness. The digital display is backlit as well, using a soft blue light that won’t wreck your night vision. Although this pressure gauge uses batteries, you’ll get several years out of them. It shuts off automatically, only measuring pressure when you’ve got your finger on the trigger. This means that, unless you’re holding it in your hand, it’s impossible to leave on. When you do need to replace the batteries, they’re readily available. It uses CR2032 buttons cells, which are the most popular type. You can find them inexpensively at any department store, making the cost of ownership low. Sure, there might be cheaper options on the market. But for the money, you’re not going to find better build quality out there. It’s well made, easy to use, and simply an excellent choice. They are available in multi-unit packs so you can keep one at home, in your glove box, and on your bike. 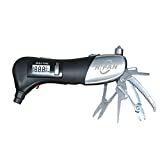 Digital Tire Pressure Multi-Function Survival Tools: Tire pressure gauge comes with a safety hammer, a flashlight, a seatbelt cutter, a tire pressure gauge with screen display, two screw drivers, a scissors and a pliers. Meets all your needs for Car, Motorcycle, SUV, Truck. 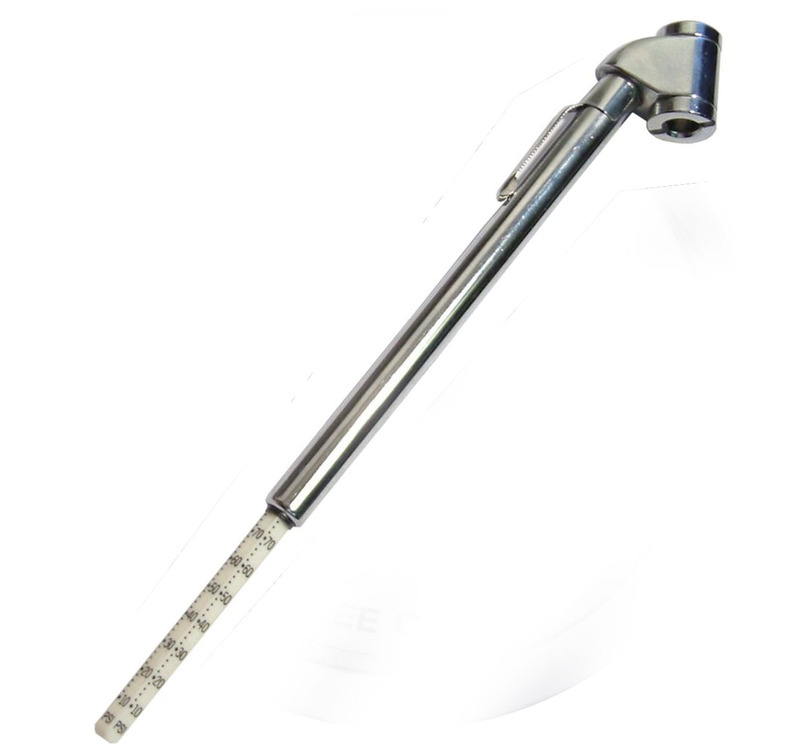 This Tire Pressure Gauge is easy operate by all adult with one hand and can easily fit in the glove box of your car. Include LED Flashlight, Safety Escape Hammer, Safety Belt Cutter help you in case of some dangerous condition wherever in outdoor, home or in the car. It is rubberized for easy grip and features a soft, Non-slip surface while using. Stainless steel also protect the best gauge water proof. Accurate:Digital tire pressure gauge Check your tire pressure in a snap, day or night, on a backlight digital screen. Get your reading in PSI, BAR, KPA, And KG/CM^2 with a range between 2-150 PSI and a ±1 error range. 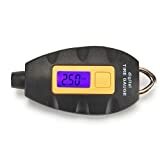 Easy to Use: Tire pressure gauge electric tire pressure meter Simply press "ON" direct the air faucet to tire air valve and press in, the blue backlight appear the digital number and can choose the 4 pressure scales. if you want to test again, long press "on" to turn off and do it. Next time you turn the tire gauge on, it recalls the last pressure scale used. 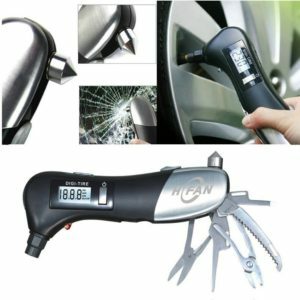 Affordable Quality & Friendly Service : You'll love the price and the fact that every HFAN tire pressure gauge is individually tested, so you can be sure it will arrive in good working order.And comes with a full 12 month warranty, 30 days money back guarantee. Although a tyre pressure gauge is a necessary tool, it’s certainly not the only thing you need to have in your kit. If you’re really looking to ensure that your bike is roadworthy at all times, you need a full toolkit. This is where the HFAN digital pressure gauge comes in handy. Outside of the standard features, it’s designed to be used as a multi-tool, providing you with 9 different compact tools that can help you solve almost any bike issue. The bonuses are certainly a nice extra, but it’s important that the gauge itself is high quality. Luckily, it doesn’t disappoint. The display is large and easy to read, and you can change the units with the touch of a button. It supports PSI for those of you who prefer imperial measurements; and KPA for those on the metric system. For specialty tyres, it also provides readings in BAR, KPA and KG / CM2. It has a range from 2 to 150 psi, making it suitable for all bike types. What else do you get? It also has a bright white LED flashlight built in, a glass breaking hammer, and a pair of scissors. Those are great in emergency situations, but the most useful part of the tool is the Allen keys. These are incredibly helpful for adjusting the tension on your chain or setting your brakes. When used in conjunction with the mini-pliers, you can do virtually any repair roadside, ensuring that your favorite ride will always be roadworthy for the way home. If that’s not enough for you, it measures the current temperature as well! Serious racers know that hot or cold weather can impact the pressure in your tyre, so the temperature sensor allows you to plan for the future, eliminating unwanted surprises. Designed to maintain correct tire pressure, reduce tire wear and extend tire life; digital display reading instantly and clearly being shown, no longer do the guesswork of analog gauges. USE DAY or NIGHT: The purple LED lit nozzle and backlit display screen is designed for easy visibility in low light or at night. 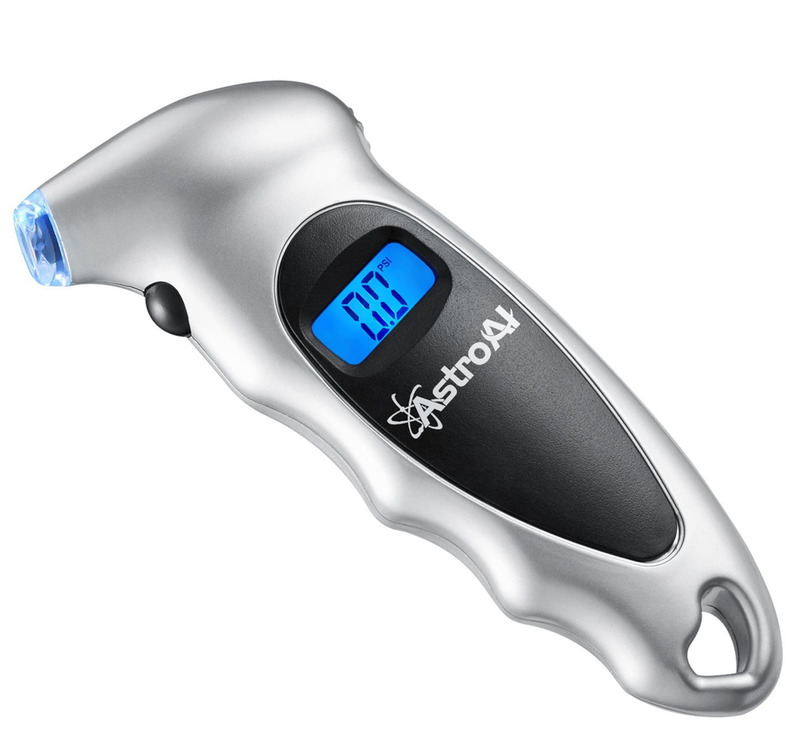 The Ionox Tire Gauge comes with batteries included, so it is ready to use. The front and back side have substantial black non-slip rubberized grips for easy use in any conditions. PRODUCT DETAILS- Dimensions: 3.74*0.77*1.78inch Weight: 3.2 ounces. Color: Black. Required: One 3V lithium coin cell battery (included). Measurement system: Metric. Ranges: 0-150 PSI, 0-10 Bar, 0-10 Kgf/cm, 0-1000Kpa. WARRANTY SERVICE: All orders are covered 12-month manufacturer warranty , 45 days money back guarantee or Free Replacement & friendly online service from Monday to Friday. SIMPLE TO USE : Press the button to turn it on. Press it again to change from PSI to any one of four pressure scales. Press and hold the button to turn it off. Next time you turn the tire gauge on, it recalls the last pressure scale used, which is an exclusive feature. After 30 seconds, the digital tire pressure gauge display will automatically shut off. Store it in your glove compartment, center console, door pocket, or in the trunk - it will fit almost anywhere.Powered with built-in battery. Even if you’ve got the perfect bicycle repair kit, you’ll always be facing one problem: carrying it around! Storage space on a mountain bike is limited, and most would prefer to transport a water bottle rather than a toolkit. After all, tools are one of the things that you don’t expect to use, but can bring your repair to a halt if you don’t have the right ones. Toogood’s digital tyre pressure gauge offers the perfect compromise. It’s something that you can always have on hand, but never have to remember. How is that possible? It’s all thanks to one simple thing: a metal bar. This bar can be clipped onto your keychain, and its compact design makes it no larger than your typical remote starter. It’s got smoothly rounded edges so it won’t poke into your pocket. Underneath the smooth plastic exterior is a surprisingly powerful and easy to use pressure gauge. It only requires a single button to operate, and the backlit screen means that you can comfortably use it day or night. The button cell battery is reliable enough for daily pressure checks and can last an entire year. If storage space is at a premium, then we highly recommend this option. Getting your tyre pressure right isn’t an exact science. Professional riders like to experiment and see how different pressures affect their ride. If this sounds like you, then the Accutire MS-4012B is the gauge for you. The thing is that even small variances in your tyre pressure can create a noticeable change in response. So if you see yourself playing around with different pressures, you want a tyre pressure gauge with superior accuracy. The Accutire MS4012B is a heavy duty gauge that can measure pressure in half-pound increments. It measures any range from 5 to 150 PSI, making it accurate to within 0.3%. This is among the best in the industry, making it one of our top choices. But a highly accurate sensor isn’t all this gauge has to offer. It’s got an incredibly durable enclosure, allowing it to withstand much more abuse than your standard gauge. The frame is made from steel, although the handle is wrapped in rubber and angled for comfortable, ergonomic operation. Available in packs of one or two, this option is affordable enough that you can buy one for your car, and one for you bike without breaking the bank. SUPERIOR PUMP - NEW best in class pump, with powerful 35 l/min air-flow. Capable of inflating a mid-sized car tire from flat to 30 Psi in under 3 minutes (time varies upon tire size). The pump is also the quietest in its category and can be relied on in an emergency. VERY SIMPLE TO USE - Plug into your 12 Volt cigarette lighter socket or other 12 V outlet. 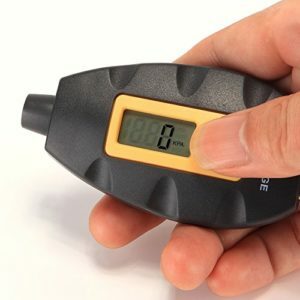 Easily set pressure on the NEW fantastic backlit LCD display gauge, connect to tire valve with the NEW quick connector. Microprocessor monitors tire pressure and will automatically stop at your set pressure +/- 1Psi at 35 Psi. This removes the need to keep checking the pressure and avoids over inflation. INCLUDED - Carry case, 4 Spare Dust Caps, Presta to Schrader valve adaptor for your bicycles and an exclusive Digital Guide to Tire Care. We will ensure you are satisfied with our product and offer our 100% satisfaction MONEY-BACK GUARANTEE! Knowing your tyre pressure is only half the battle. If your measurement is out, then it’s time to bust out the pump. If you’re sick of manually pumping your bike tyres, why not find an automated way to do so. 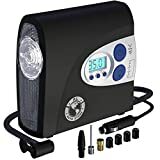 If this is something you’re interested in, the best deal on the market is the PI Auto Premium Digital Tyre Inflator. This unit combines the functionality of a digital pressure gauge and a DC compressor all in one. Just plug the compressor into the AUX outlet of your vehicle, and use the simple controls to set your desired pressure. At the touch of a button, this compressor will automatically inflate your tyres until they’ve hit the correct pressure, then shut off the compressor. This tyre inflator is extremely fast and surprisingly powerful. But that doesn’t come at the expense of precision. You can fill a bike tyre with an accuracy of 1 PSI, which is acceptable for almost all users. The inflator comes with a free set of valve caps, as well as replacement presta valves. Consumers who’ve upgraded to presta valves know how frustrating it is to be caught with a damaged valve, so having an extra one on hand is nice to have. Before you can select a gauge, you need to understand how to use it. Different gauges are suited for different purposes, and there are several different ways to use them depending on how you like to ride. First, let’s go over the basics. To accurately measure pressure, you need to first remove the cap from the valve stem. You then press the gauge inlet down over the valve stem. You may hear a hissing sound. It’s important to press down hard enough that you don’t hear any hissing. When air is escaping, the pressure is artificially low – so you won’t get an accurate reading. But once the sound has stopped, you’ll have a proper seal and the displayed measurement should remain stable. You’ll also need to decide when to check your tyre pressure. There are two types of measurements you can take: a cold measurement, and a warm one. This has nothing to do with the weather, but more to do with how recently you’ve been using your bike. You should take a cold measurement once per week. If you’ve recently ridden the bike, it should be left to cool off for at least one hour before taking a measurement. If there is any discrepancy between the pressure your bike tyres are rated for and the actual pressure, this is when you fill it. A warm measurement should be taken while you’re riding. Let’s say, for example, you’re tearing your mountain bike down a rough path. Your tyres will warm up, and the pressure will increase. You might notice that your ride feels a little hard, indicating that the pressure is too high. Or, you might notice that your tyres and squishy, and don’t have as much traction as they should. This could indicate a low tyre, or not enough pressure. Warm measurements will tell you how much to fill your tyres next time you top them off. If you’re always 2 PSI too high, you can fill them 2 PSI below their recommended pressure. Some riders also choose to keep their pressure artificially low, or artificially high to get your desired riding style. Taking warm measurements will help you understand how pressure changes when in use, so you’ll know what to apply at the pump to get the desired fill. Which Bike Tyre Pressure Gauge is Right for Me? Not sure which one to choose? There are a lot of different options out there, and each of them has their own sets of advantages and disadvantages. But before you choose one, you’ll need to understand how to use them, and what you’re hoping to get out of your pressure gauge. If you’re just looking for something simple, our first recommendation would be for the Tekton 5941 Digital Tyre Gauge. It’s simple, easy to use, and provides all the basic necessities for checking your tyre pressure. Because of it’s compact nature, you can carry it around everywhere you go. It’s reliable and easy to use, thanks to the built-in backlight and ergonomic grip. You can use it whenever, wherever, making it a truly universal tool. If you’re looking for something a little more advanced, you should look and see what other tools you have laying around. For the beginner who might not have a bicycle repair kit, the HFAN Digital Tyre Pressure Gauge is a fantastic choice. 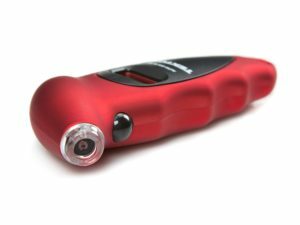 Not only does it have an accurate, easy to read pressure sensor; but the handle comes complete with a full toolkit needed for on-the-go repairs. You get an Allan wrench, micro-pliers, a LED flashlight, scissors, and a few other handy tools. Without spending any extra money, you get a ton of additional hardware. Do you have a portable bike pump that you take with you, everywhere you go? In that case, you should have a digital pressure gauge that is just as portable. Very few can come close to the portability offered by the Toogood Digital Tyre Pressure Gauge Meter. It’s got a metal hook that allows you to clip it to your keys, lanyard, or any other portable clip you’ve got on hand. It’s extremely lightweight; but durable enough to withstand the abuse of even the hardest riders. Don’t own a pump? Not interested in taking the time to fill your tyres manually? Let the P.I Auto Store Premium Digital Tyre Inflator do the job for you. Using it is simple. 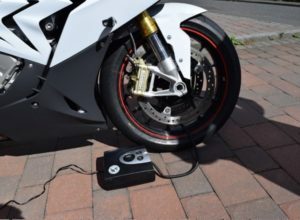 Just pull your bike up next to your car, and use your 12V power source to power on the unit. On the main display, set your desired pressure, attach the hose, and press the “start” button. The built-in compressor will automatically fill your tyres to the appropriate pressure, and stop when it hits your set point. This method of filling is extremely accurate, and the fact that it uses a digital tyre pressure sensor means that it’s more accurate than anything else on the market. Alternately, check out our guide to the best bicycle pumps. We’ve covered the best models on the market, so you can find one that best suits your needs. Looking to step away from the manufacturer recommended pressures, and start playing around with how your tyre pressure affects your riding style? It only takes a minimal chance of pressure to make a large difference in the way your bike feels, so you need something with extreme accuracy. In this area, there is nothing better than the Accutire MS-4021B. 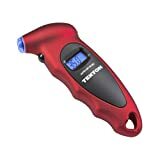 This digital tyre pressure gauge is among the most sensitive on the market, letting you take measurements in 0.5-pound increments. This will allow you to get your tyres exactly where you want them, leaving very little to guesswork. To top it off, it’s also built to an incredibly high standard. This means that it’s not going to get damaged, even if it accidentally goes flying during an unintended spill. Overall, all five of these digital tyre pressure gauges are impressive in their own regard, but the one that you choose depends on your own particular set of needs. By following the information outlined in this guide, we hope that you’ve found the solution that will make your tyre pressure problems a thing of the past.